Has the day to day of living tried to steal your joy? abundance, partnership and enjoyment of life? to fully embrace your life with gusto…everyday? or an addiction to pharmaceuticauls or illegal drugs? Honest, gripping and inspired, Kira’s C.U.R.E. is a firsthand account of spiritual teachers, Sri Ram Kaa and Kira Raa as they walked through the “hell” of illusion to discover the C.U.R.E. that is available to us all. Kira Raa specifically was diagnosed with Lupus, Fibromyalgia and Chronic Fatigue while Sri Ram Kaa learned how to navigate his role as a spouse of one who is afflicted. 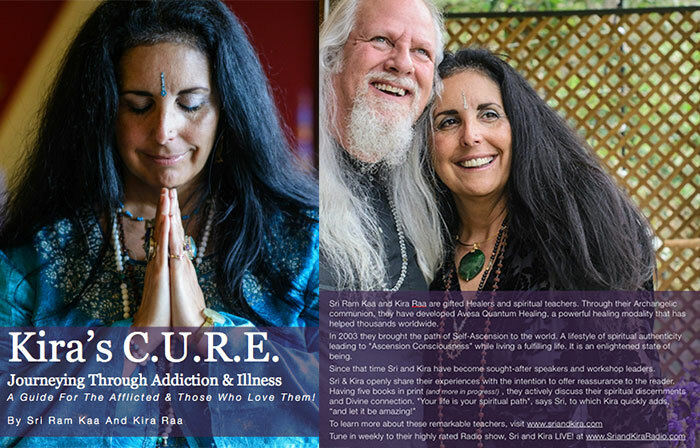 Through extraordinary life events, (including an attempt on Kira’s life by outside persons), and the addiction to medicines prescribed to assist, together they discovered the C.U.R.E! Regardless of your life’s challenges, this short and powerful text will offer you the insights, tools and direct steps to assist you to break free! Share this book with anyone seeking to break free from the pain of life. It can be physical, emotional, spiritual or all of the above! Written as a service to all this book also contains links to many resources that will assist you with your journey! “I am LOVING Kira’s C.U.R.E. }… from diagnosis to C.U.R.E. is where I am at right now. Firstly your introduction, personal experiences, who you are, experiences that challenged you, the onslaught of negative … the external feeling that life as you’d known it was crumbling, breaking down to ashes for your rebirth … your very human feelings, concerns … trials and elevation … I felt like I could hear you talking very personally and openly … laying it all out there. While at the same time I also got it that you KNEW that all of these experiences, feelings, ill health was really a gift that would revel itself on an even larger stage! I already feel the strength of empowerment vis a vis your experiences, wisdom, transparency and TRUTH! I already feel that there is HOPE for my (ill) state of being, the nicotine demon, my resistance to the changes necessary in order for me to live my life to the fullest, energized and undaunted.